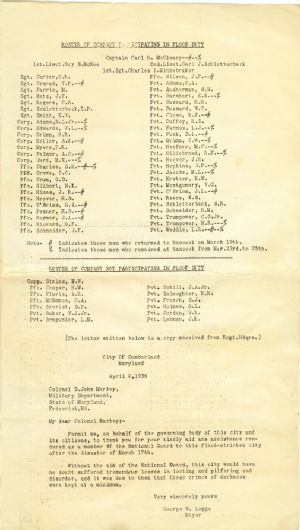 Note # Indicates those men who returned to Hancock on March 19th. % Indicates those men who remained at Hancock from Mar.23rd to 25th. Colonel D. John Markey, Military Department, State of Maryland, Frederick, Md. Permit me, on behalf of the governing body of this city and its citizens, to thank you for your kindly aid and assistance rendered as a member of the National Guard to this flood–stricken city after the disaster of March 17th. Without the aid of the National Guard, this city would have no doubt suffered tremendous losses in looting and pilfering and disorder, and it was due to them that those crimes of darkness were kept at a minimum. Maryland National Guard, Co. B.